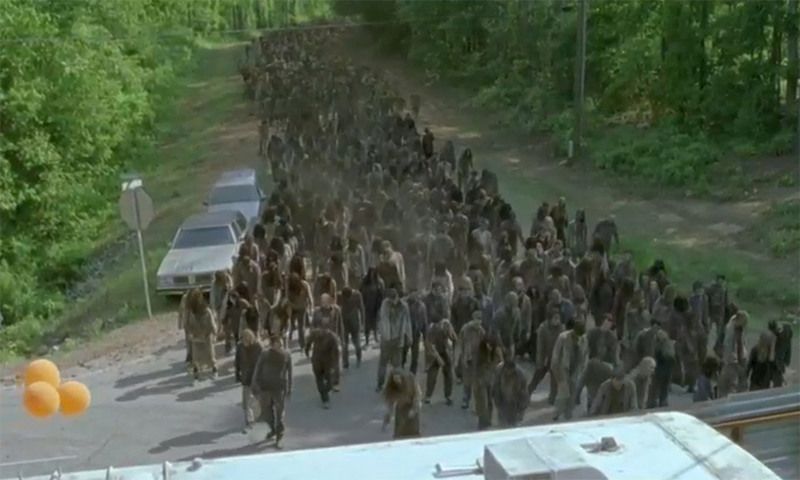 The episode is told in two parts, with the events leading up to the walker parade shown in black and white, while the actual activity to move the thousands of walkers is in color. It cuts back and forth, in short bursts, delivered in minutes. It’s a compelling way to tell the two stories, by building the suspense and sense of urgency, both within Alexandria and during the march from the quarry. It begins at the very moment where last season ended. Pete has killed Reg, and Rick, at the order of Deanna, has shot and killed Pete. Morgan appeared in all of this chaos, looking to be in much better shape, both physically and emotionally, than Rick has been these past few days. Gabriel’s treachery against the group, the lies and fear-mongering he tried to sell to Deanna and others, proved to make him look like the weak little man he is. His loyalty is with no one but himself. In fact, the things he did and said revealed that he even he was even willing to betray God. Tara is awake and okay. Glenn and Maggie are reunited. Eugene’s hair stood the test of the walkers. Morgan and Rick have a lot to talk about. Things were very different, the last time they saw one another. While the two men discuss Alexandria, its people and its beginnings, Eugene is covering the gate. A truck pulls up and a young man gets out and introduces himself as Heath, and his two friends as Scott and Annie. They’re also Alexandrians who have been out on a run. As Rick and Morgan walk through Alexandria, they find Carter and Gabriel digging two graves – one for Reg and one for Pete. Rick doesn’t want Gabriel digging a grave for Pete, at least, not within the walls, because he’s a killer and Deanna agrees. Morgan whispers to Rick that they’re killers, too. Rick and Morgan take Pete’s body out into the woods and, as they begin digging, Rick hears a sound. Ron, who followed the two men into the woods to see where his father was to be buried, is being chased by walkers. After dispatching that threat, the three of them see a quarry, filled with thousands of walkers. It was from there that the few stragglers of them had managed to make their way to Alexandria. This poses a real threat to the community because there’s very little holding them back and the barriers that were set up are beginning to fail. When they return to Alexandria, Rick tells everyone what they saw and begins to spell out his plan. He also asks for volunteers to take part in it. Glenn, Michonne, Abe and a few others are a given, but when Gabriel raises his hand, Rick simply says “No.” To Glenn’s disgust, Nicholas also volunteers and Rick accepts. Carter is dragged into the plan, reluctantly. After the meeting, while the townspeople get to work on the wall project, Maggie tells Tara about Nicholas and how he could be exiled if she gives the okay. Tara says that if Maggie could forgive her, even after the awful things at the prison, maybe Nicholas could use some forgiveness, too. Daryl tells Rick that he thinks two more people should be included in the plan, two different people, but that it’s up to Rick. What Daryl really wants is for more people to come to Alexandria, believing that there’s safety in numbers, but Rick isn’t open to that idea. All Rick can envision is more people who can’t protect themselves, meaning a greater burden on him and those who already know how to. Carole is handing out cold drinks at the work site and Morgan asks her if she was once a cop, too. He thinks she’s always observant, always ready. Carol thinks his comment is sweet. Compliments sound different to ladies after a zombie apocalypse. Rick and Deanna spend a few moments talking about Reg, when some walkers come out of the woods. Rick and his group do what has to be done, but the Alexandrians are clumsy, inept and completely baffled by what they should do. Carter has gathered his own smaller group for a clandestine meeting during which he expresses the need to kill Rick. Eugene, who has been getting supplies, overhears the conversation, then drops a can, falls into some shelving and finds himself at the end of the barrel of Carter’s gun. Rick, Daryl and Morgan walk in and takes the gun from Carter. Rick informs him that, since he can’t take the community from them, he could try working with them. Later, Rick finds Morgan sitting on his front porch. They talk about Carter and how he doesn’t get it. Carter is the type of person who gets killed in this new world because he refuses to accept the danger and prepare himself for it. Rick tells Morgan that they know each other, even if it’s the first time, then hands Judith over to him to hold. While Michonne listens from the doorway. Rick invites Morgan to move into their house. Rick wants a dry run of the plan, but the walkers are coming through the barricades in greater numbers, so the event has to go live. It’s s good plan and everyone knows what they’re supposed to do and when they’re supposed to do it. It’s prefect in its simplicity. The idea is to push the walkers through a series of openings, into a gauntlet of parked vehicles, then out onto the main road until they can be led twenty miles away from Alexandria by Daryl on his motorcycle and a car manned by Abe and driven by Sasha. It’s going well. Flares are fired at checkpoints to draw the walkers in the intended direction. Abe seems to be enjoying his role a little too much, but asks Sasha if she’s doing this because she wants to die. She tells him that doing something this big is living. Glenn, Nicholas and Heath are farther up the road, clearing a John Deere dealership of walkers, whose sounds could distract the much larger herd. They succeed and Nicholas proves his worth to Glenn wo is doing his best to trust him again. Back on the parade route, walkers are making the turn at Alexandria’s wall, with a few walkers, who didn’t have time to rehearse, smashing sloppily into the barrier. Up ahead, Carter goes into the woods to take point, telling Rick that he was right – the plan is going to work. A stray walker comes upon Carter though and bites his face. He begins to scream and Rick, Michonne and Morgan run to silence him, as his screams are drawing walkers. Rick is forced to kill him before he turns and to stop his screams. It was inevitable. Rick said it would happen to Carter and to anyone like him. The group fires their guns to bring the herd back on course, and they seems to draw a collective sigh of relief. Only twenty more miles and the community is out of danger. Then there’s the sound of a horn – a long loud blaring of a truck horn, sending a directional signal to the walkers, straight to Alexandria. This entry was posted in Walking Dead and tagged #TheWalkingDead, Abe, AMC, Carol, Daryl, Deanna, Glenn, Maggie, Michonne, Morgan, Rick, The Walking Dead. Bookmark the permalink. “Compliments sound different to ladies after a zombie apocalypse.” Don’t they?! lol. Thanks so much for the recap! I didn’t fair very well with the story going back and forth, however, it was helpful they utilized B&W in doing so. Morgan seemed a bit judgemental of Rick…how Rick has changed, but that is what it took for him to survive and keep his children and people alive as best he could. I really didn’t get the Michonne and Morgan both giving the eye for killing Carter – it was a given, he had to go! That was a strong opening….except there were entirely too many commercials….getting a bit greedy with their ratings, eh? TT, I don’t know if Morgan is judging Rick as much as he’s trying to figure out who Rick is now. The two men seem to have reversed roles and personalities. I agree. Why is Michonne giving him the judgy eyes when Rick has proven himself millions of times? Good question. All I can think is that Michonne is worried that the group will get kicked out of Alexandria if Rick goes too crazy. Daryl is giving Rick a little side-eye, as well. Great Blog Empress….wowza…I said the same thing about the zombie bbq but Princess Beanie Boo told me that doesn’t kill them and you would have thousands of burning zombies walking around. I don’t understand the “judgey eyes”….Rick did what he had to do…. and that horn, ugh~!